Maiden of light and Mother of Love, Crone of Wisdom, she who guides all who seek her vision, I chant for thee! 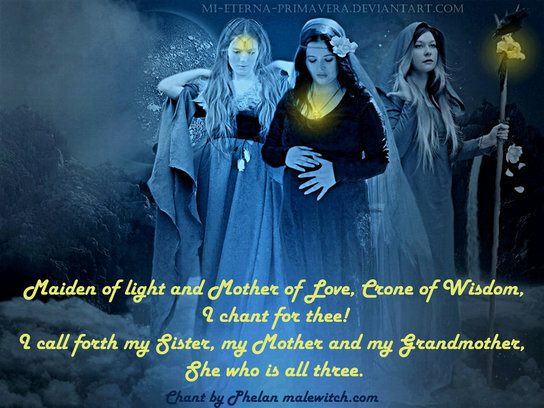 I chant for thee and I call forth my Sister, my Mother and my Grandmother, she who is all three. I chant for thee and with each call I cast out doubt, I cast out unhappiness and I cast off the chains and restraints that bound me, holding me back from my goals which are within my grasp. I chant for thee little sister, I chant for thee Mother and I chant for thee Grandmother, send forth your light, love and guidance, for my heart is now open and my thoughts are now pure, I live within the moment and I strive for a better tomorrow, send forth all that I need to accomplish and achieve my life's work and I return to thee my devotion, my loyalty and my respect!